Whether you are planning on getting married soon, or will simply be a part of a wedding party this season, girls with curls have lots of options. 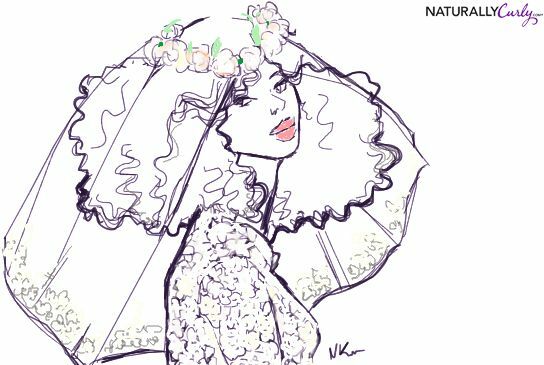 Most curly brides are embracing elegant styles, and who wouldn't-- it’s YOUR big day. But that doesn’t mean that you need to get out the flat irons or start with keratin treatments today. Embracing your natural curls and waves and enhancing them, showing them off, for your special day, can be a great option. Where to begin? Look for photos of styles and ideas that you like and come prepared with creative ideas to your stylist. Let him or her know exactly what type of style you’re looking for and that straightening isn’t an option, but enhancing the natural beauty of your hair is. Ask for some trial runs and ideas and input from their view as well. While it might take a bit of creativity and practice to find a desired style, there are plenty of options for a natural bride who wants to glam up her everyday look for her wedding day. Keep reading for 3 ways to veil your curly crown. This year, we're seeing this floral look everywhere. 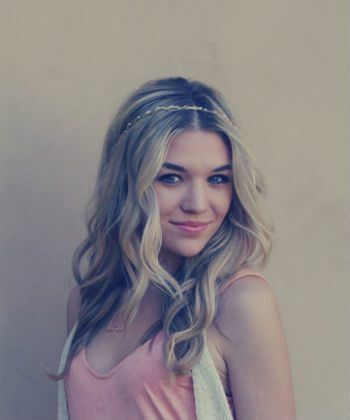 Decorate a full head of curls with beautiful flowers, metal or a decorative side clip. A bride can style her hair underneath as she does everyday—with twists, or loose curls (formed with Curly Hair Solutions Curl Keeper and Curly Hair Solutions Extenzz stretched with a root brush, or done completely freeform with some Curl Keeper as a styling product). Others might prefer to pin up coily hair or sweep it to the side. The accessory can then be placed in a desired position for a look of old-school glamour. Leaving some loose tendrils on the forehead or at the temples adds softness and elegance. We found some super cute ones online by Pretty Little Titch. Traditional veils work well with most wedding hair styles, but the trendy birdcage veil seems to go especially well with tight curls, as the netting shows off the texture of the hair. Perch the veil slightly past the crown of the head and let the birdcage netting rest on the forehead. The top of the veil, which usually contains a decorative ornament, adds to the glamour. Use a rhinestone crystal hairpiece to feel like a princess with your natural hair. Have your stylist create a voluminous half-up, half-down style. Cleanse and condition hair, use a leave-in conditioner paired with a styler to create definition, and pull the hair of the crown through the center of the headpiece.Pin the headpiece in place to create a tiara effect, and allow hair to dry through a combination of heat drying and air-drying, so it can grow fuller and larger.Brides have enough to worry about on their wedding day, and hair styles shouldn’t be a worry, but something to enjoy and have fun with on the big day! Tara Lisciandro-Hornich is a Type 2/3 curly mom as well as healthy lifestyle advocate. Read her articles here.